A philosophy writer and researcher specializing in Chinese Philosophy, Confucianism, Neo-Confucianism, and comparative philosophy, Stephen C. Angle’s research focuses on philosophy’s role in human rights, politics, and ethics both in China and globally. Angle’s work is informed by an on-going exchange of ideas with colleagues in universities in China, Hong Kong, Taiwan, Japan, Korea, Germany, and France, and through his international philosophy blog, http://warpweftandway.com/. Fluent in Mandarin and in classical Chinese, Angle has spent Fulbright years in Taipei and in Beijing, and was a Berggruen Fellow at Tsinghua University during academic year 2016-17. Many of his books and essays have appeared in Chinese translation. 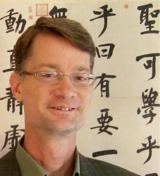 Angle’s books include Neo-Confucianism: A Philosophical Introduction (co-authored with Justin Tiwald; Polity, 2017), Virtue Ethics and Confucianism (Routledge, 2013), Contemporary Confucian Political Philosophy: Toward Progressive Confucianism (Polity, 2012), Sagehood: The Contemporary Significance of Neo-Confucian Philosophy (Oxford, 2009), and Human Rights and Chinese Thought (Cambridge, 2002). Most of Angle’s publications are freely available at his website, and his full CV is here. Angle received his B.A. from Yale University in East Asian Studies and his Ph.D. in Philosophy from the University of Michigan. Since 1994 he has taught at Wesleyan University, where he is now Professor of Philosophy and Mansfield Freeman Professor of East Asian Studies. In March 2010, Angle presented the inaugural Tang Junyi Lecture Series at the University of Michigan. Angle is a recipient of two Fulbright grants, a Millicent C. McIntosh Fellowship, a Chiang Ching-Kuo Postdoctoral Research Fellowship, and the Binswanger Prize for Excellence in Teaching. He is a past President of the International Society for Comparative Study of Chinese and Western Philosophy. Stephen C. Angle © 2019 All Rights Reserved.